Professor Whitehead's students travel to the Dagara Music and Arts Center in Ghana to study traditional Ghanaian xylophone and drumming styles. Professor Whitehead also directs the VOICES Multicultural Chorus, an Ithaca community chorus dedicated to learning, sharing, and singing songs from diverse ethnic choral traditions and promoting racial and cultural harmony through the experience of singing. African treasures gathered from his trips to the continent adorn his office. Authentic xylophones and drums embellish shelves and cabinets, while a colorful, handwoven cloth brightens the room, and an African tapestry hangs on the wall behind his desk. But these souvenirs of Africa do more than simply decorate -- they symbolize the effervescent cultural awareness and the dedication to global understanding of Professor Baruch Whitehead. After joining the Ithaca College music faculty as an associate professor of music education in 2002, Professor Whitehead eagerly set out to expand the realm of world music courses offered in the music school. Encouraged by his colleagues, he soon connected with Bernard Woma, the director of the Dagara Music Center in Medie, Ghana. Whitehead ventured to the center for the first time during the summer of 2004 to learn the art of African drum and dance. “I felt like kissing the ground when I got there. To go to Africa -- for me it has just validated my being,” says Whitehead of his first trip. Feeling as though his experience in West Africa would greatly interest students, Whitehead launched a short-term study abroad program in Ghana when he returned to IC. 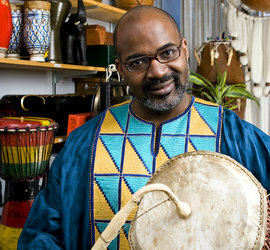 Soon thereafter, he created the African Drum and Dance Performance class. The success of his programs has followed from his success in learning the art himself. Now one of the most difficult music classes in which to enroll -- it fills almost immediately after registration begins -- the African Drum and Dance Performance class has grown exponentially. A participant in the class himself (predominantly drumming), Professor Whitehead creates a unique, hands-on learning environment for his students and encourages everyone to experiment with each facet of the class: percussion, dance, and vocals. Students spend most of their class time learning new instruments, dance moves, rhythms, or lyrics as they collaborate and perform with the rest of the ensemble. Though he would like to increase awareness about the Ghana trip and see more students taking advantage of the opportunity, he believes that the program has succeeded in offering many students an extraordinary ethnic experience. “The students who actually go there are forever changed,” says Whitehead. While in Ghana students spend the first two weeks of the trip studying African dance and drumming at the Dagara Music Center. The rest of the time is spent traveling, visiting remote villages and art museums, watching cultural groups, and, says Whitehead, exploring the “natural wonders of Ghana.” During the most recent trip, Whitehead and his students had the opportunity to go on a safari. “[As a result of these programs] I’m more Afrocentric in my teaching, in my living, and in my being,” Whitehead says. The integration of this cultural awareness into his teaching extends to all of his classes. Primarily a professor of music education courses focused on elementary music, Whitehead emphasizes the importance of diversity in the academic world. Professor Whitehead’s commitment to cultural awareness is evident in his many other involvements and accomplishments. He founded and directs Unshackled, a Syracuse-based gospel choir, and directs the Ithaca-based multicultural chorus VOICES. In 2004, he presented a workshop dealing with African American and Native American music in Spain for the International Music Conference, and he has taught at the World Music Village in Helsinki, Finland. He will present a workshop on gospel and African drumming at the upcoming Russian Mosaic Music Festival and has also been selected to write a chapter as an international author for the upcoming book Music and Conflict Resolution.